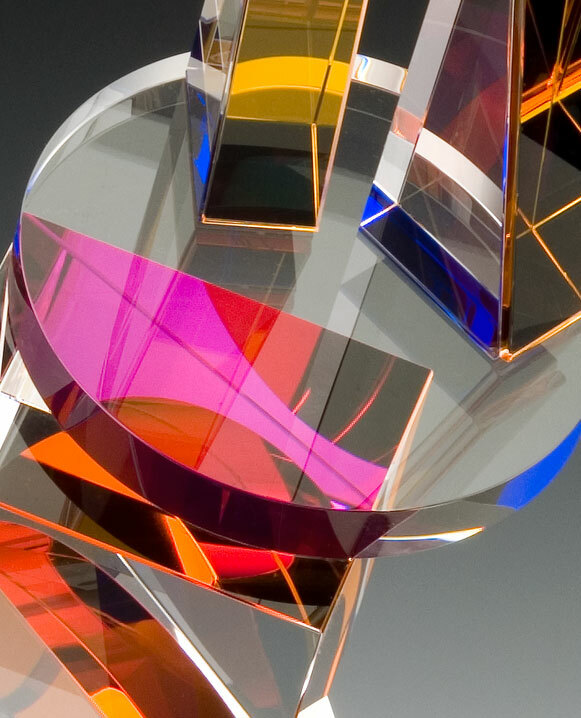 As one of the pioneers of the studio glass movement, Michael Taylor opened the door for glass as a creative means of expression, not only as design but also as a form of metaphysical geometry in modernist sculpture. 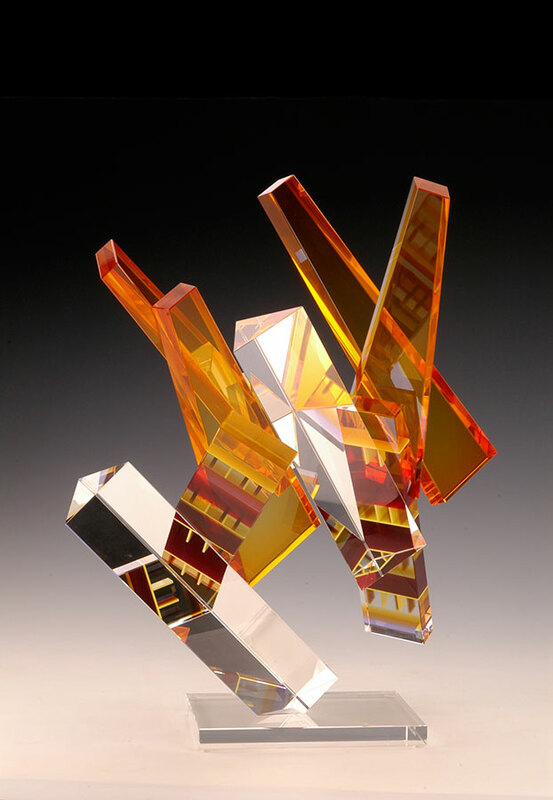 His vast body of work, spanning 50 years, demonstrates not only his mastery of the science of glass but his depth and cognitive strength as an artist. 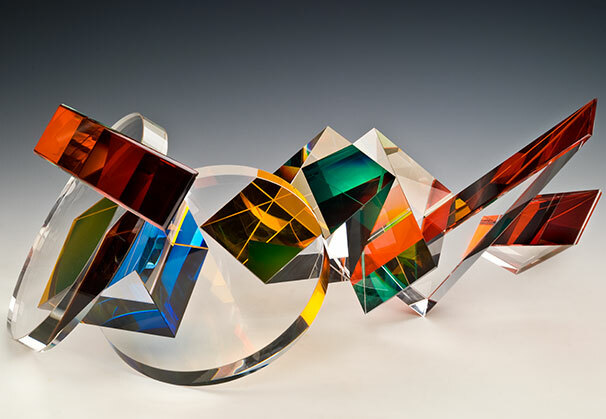 Taylor is represented by Alfstad& Contemporary, Sarasota, Florida. The intension of my thought and work is to raise the consciousness of visual arts-minded individuals to topics of awareness and social responsibility through significance of scientific topics such as movement and change. The only constant is change itself. Always moving forward. My work serves as a record of our time for now and our future. It speaks of the paradox of scientific research for society and sociopolitical balance. The future of Artificial Intelligence and its affect on humanity will be the most profound possible. 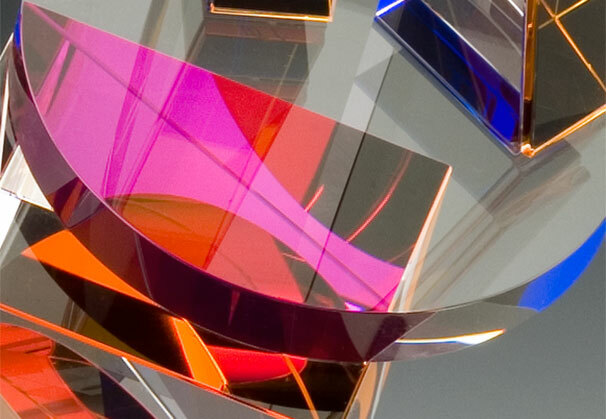 Michael Taylor is best known for his laminated glass constructions, ballets of precision-cut glass in a choreographed arrangement of color and light that illuminates their shifting interplay. 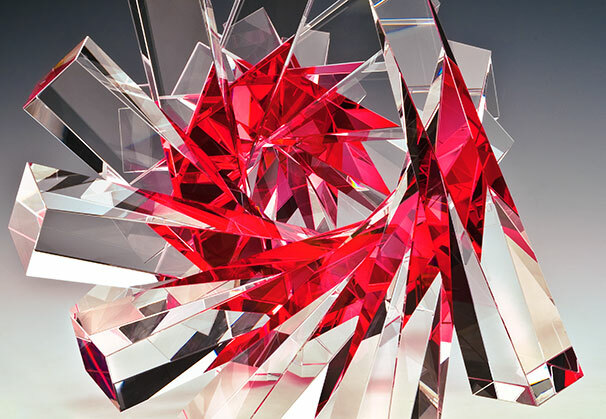 These sculptural assemblages are complex pile-ups of precision-cut optical-quality glass, never symmetrical and often intriguingly off-balance. 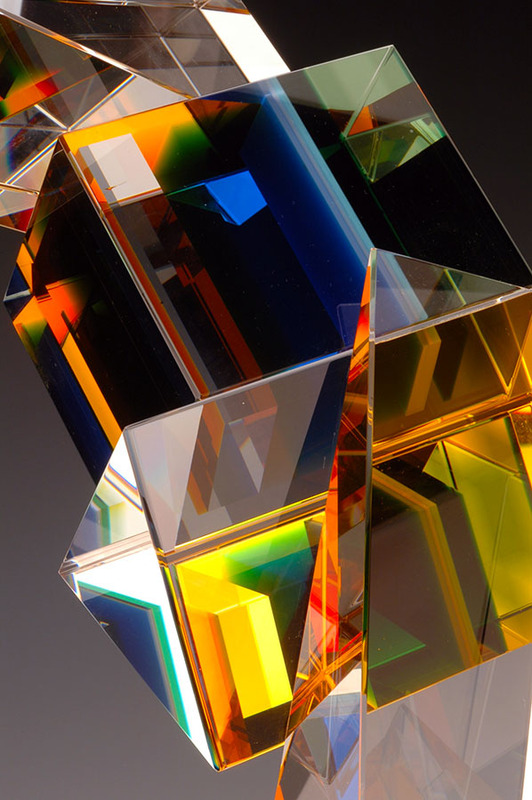 Humming with intersecting planes of hue and refraction, they appear as otherworldly machinery presenting an extreme purity of design as if teleported to our world from a science fiction universe more advanced than our own. Observing one of Taylor’s recent works, God Particle, Higgs Boson Particle, two amber-gold half circles fall open to present a faceted assemblage inside, like an egg broken to reveal a glimmering complex interior. The exposed contents include a clear Petri-dish-sized circle intersecting with a multi-planar element displaying varied hues of green – the unmistakable color of living things, from plankton to moss to the largest timbers in old growth forests. 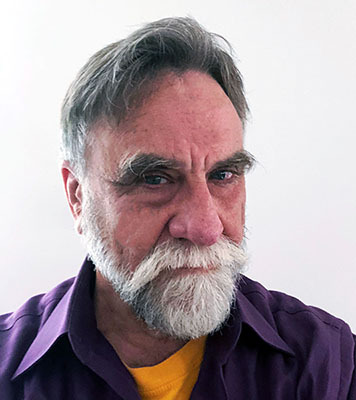 The work is signature Taylor, where contemporary intellectual and political ideas are engaged through visual provocations that entice the viewer to decode the logic inherent in these forms. Coming closer to investigate, one must often get past protective blades that extend outward from his works, shielding the contents from a casual observer. 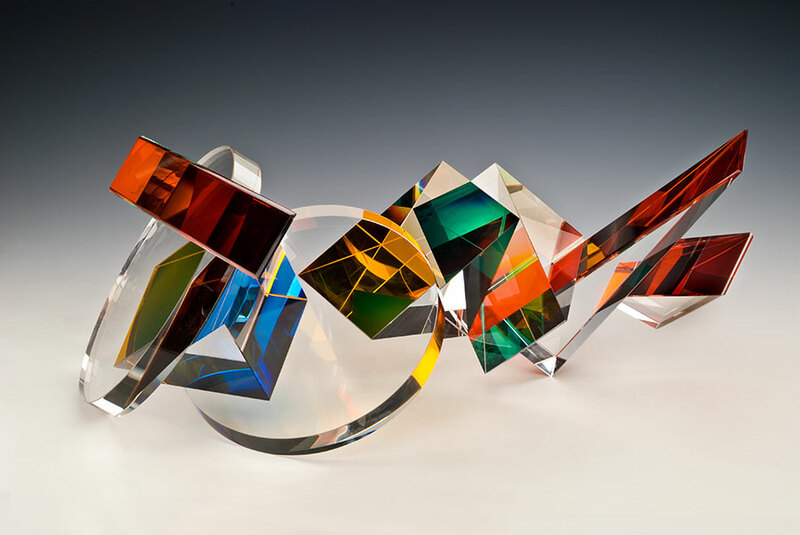 But investigation is rewarded with a surprising harmony achieved through visual logic and resolution as the refractive, chromatic, and planar collisions in Taylor’s work reveal the artist’s full powers as a colorist and light-engineer. 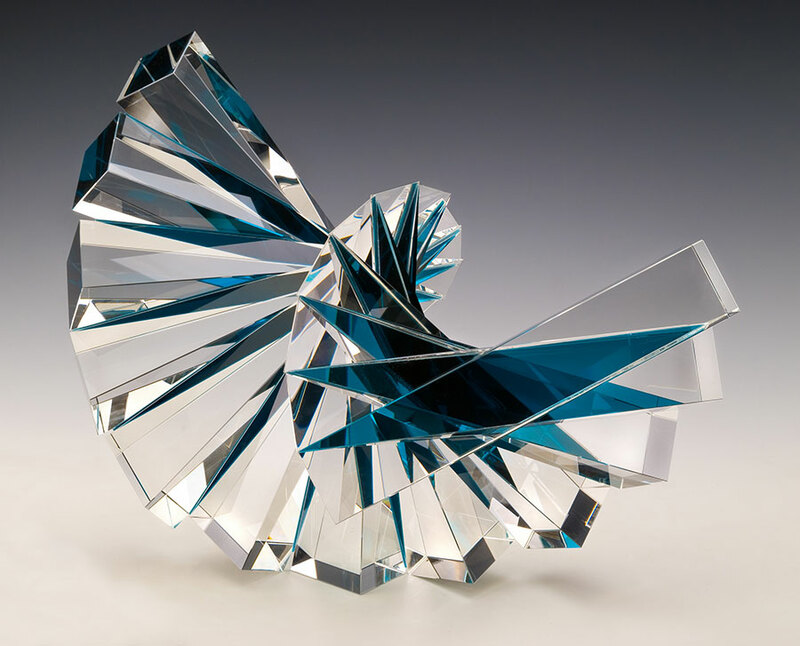 He also considers himself a Platonist, which can be defined as one who subscribes to a philosophy affirming abstract objects that exist in another realm than our internal consciousness or external world. The ancient Greek philosopher’s ideas provide a surprisingly valuable way of understanding Taylor’s engagement of scientific advances through works of visual abstraction. To stay with the God Particle, the work mediates on the nature of the essential Higgs Boson particle, the existence of which had been only theorized until 2013, when it was identified by European researchers armed with an extremely powerful particle collider. Successfully proven to exist, this particle can be linked to the very creation of the universe itself during the Big Bang, and its discovery raises as many questions as it answers. Taylor’s awe at the progress of human intelligence and ingenuity is mixed with a note of foreboding. 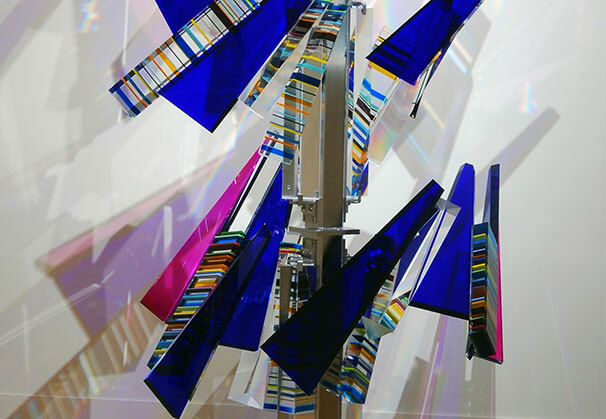 The sculptural particle that is broken open hums with intricate layers of interior light and color interwoven that provokes the viewer to contemplate the unknowability of we have wrought as we take apart our world through technology, revealing its mysteries and unleashing forces we don’t fully understand. Taylor is comfortable both extolling technological breakthroughs yet worrying about their implications. 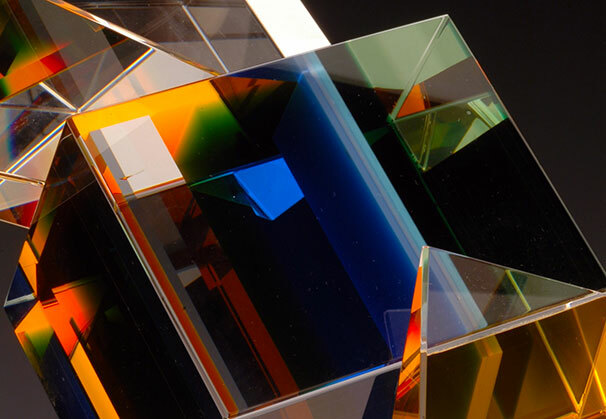 Though unafraid to take on weighty topics, many of Taylor’s neo-Constructivist works diverge from the last century’s movement in their celebration of individual experience. 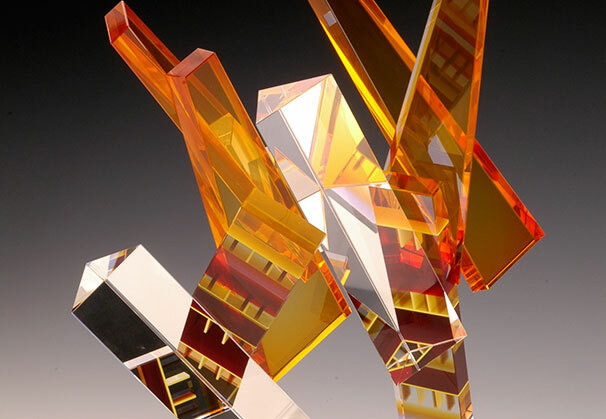 Consider the lyrical quality of works such as Deb’s Image, in which an array of amber colored triangular fins coalesces into a fireworks display of red, gold, and blue refraction. 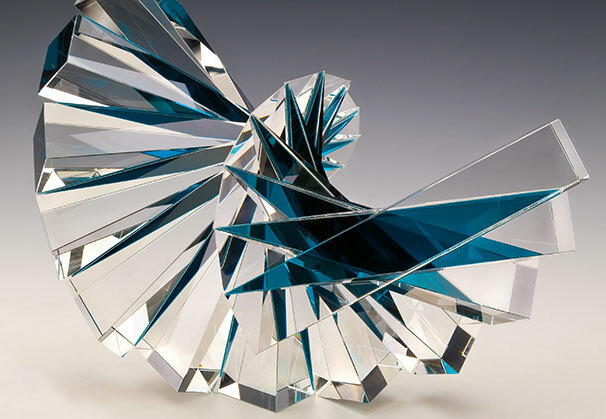 In Bird on a Shelf, the rich plumage of a winged creature is evoked through strategic lamination of an array of clear glass – it rises spectral-like from five frosted glass rods, themselves attached to twin clear triangular beaks – an abstraction of the bird form that is instantly recognizable and awe-inspiring. 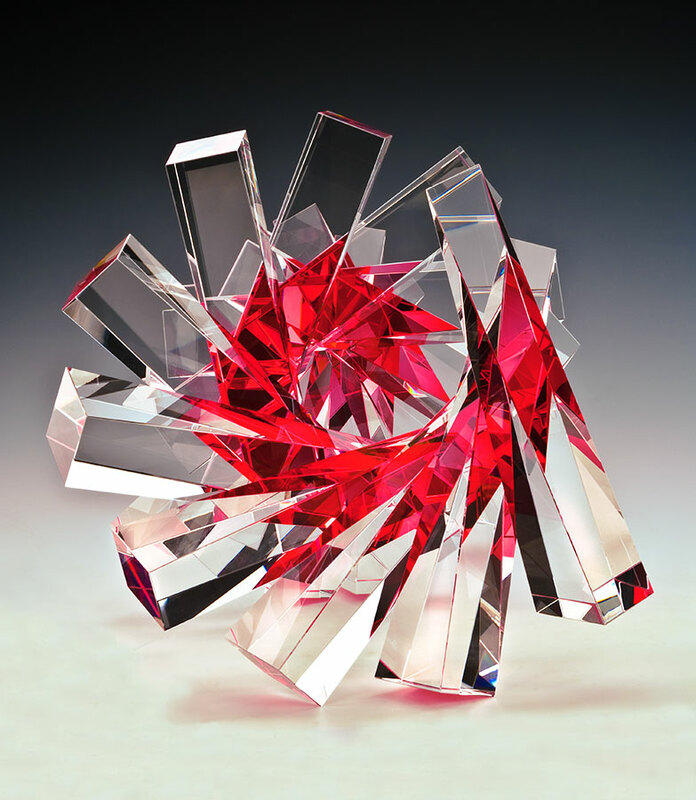 We are grateful to Alfstad& Contemporary, Sarasota, Florida, for providing the Artist of the Month.